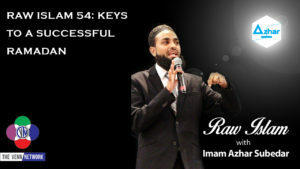 This week on the Raw Islam Podcast with Imam Azhar– a 2017 Podcast Award nominated podcast, address the Keys to A Successful Ramadan. To illustrate his point about being ready for Ramadan emotionally and mentally, Imam Azhar asks B.C. Dodge what happens when to much water is added to pancake batter. To which B.C. suggest that some horrible things should happen to the person who did such an action. As the Imam starts to share his thoughts on how to have a successful Ramadan, B.C. suggests that due to the fact that Ramadan is only 30 days most Muslims try to cram as many iftars and events that they can into these 30 days. Which can sometimes become draining on people that attend, but yet every year they try to do more and more with the same amount of time. B.C. suggests that it is inappropriate to be welcoming and treat someone nice at the mosque or event, simply because it is Ramadan, he says “If you treat me this way, and are nice to me, only because it is Ramadan; when Ramadan is over I will not be returning, nor will my checkbook.” Imam Azhar say that B.C. is absolutely correct.